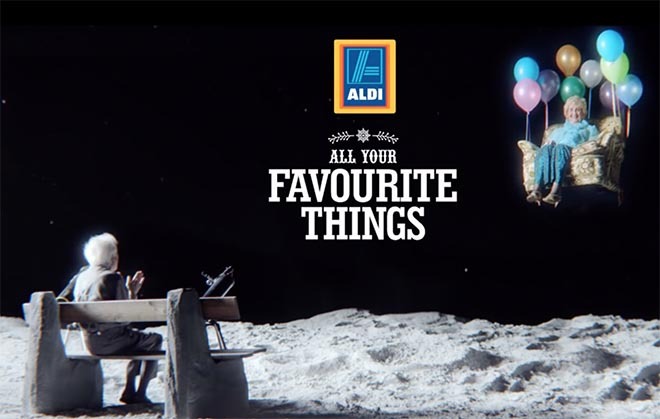 Aldi has spoofed John Lewis’ “Man on the Moon” Christmas campaign with a tactical ad marketing telescopes. 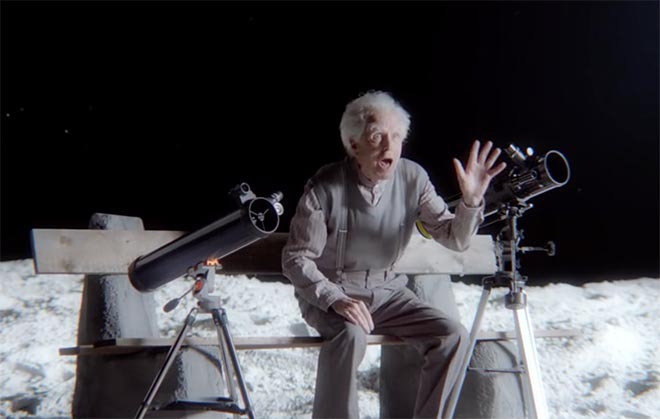 The Aldi Christmas Friend ad features its own lonely old man living on the moon, who compares the price of a telescope sold by John Lewis with a cheaper one sold by Aldi. He points to the John Lewis one and says “I like this one”, then the price of £109.95 appears on screen; then he points at the Aldi telescope and says “And I like this one”, then the price of £69.99 appears on screen. He then looks through the Aldi telescope and exclaims “But I’m over the moon with this one!” It is revealed that he has spotted a Jean Jones floating through space towards him on an armchair with balloons. Jean Jones first appeared in the 2011 “Aldi Like Brands” campaign in which she displayed her penchant for gin. The Aldi Over The Moon ad was developed at McCann Manchester by executive creative director Dave Price, creative director Neil Lancaster and agency producer Melissa Bennett. Filming was shot by director Mark Denton via Another Film Company with director of photography Miguel Ragageles and producer Sara Cummins. Post production was done at Jam Films. Media was handled by UM Manchester. Sound was designed by Parv Thind at Wave Studios. Music is “My Favourite Things”, from The Sound Of Music, recorded by up-and-coming British artist Jade Williams.